HighStreet5 Community: It's Official - Dance Crew! It's Official - Dance Crew! As Dancers of HighStreet 5 we all believe that we are more than a clan or a guild or a club - we are a Family. Here in HighStreet 5 Philippines, we are even more than a Family, we believe in camaraderie and having fun. So we asked YOU to choose the term to call yourselves in this poll. Then it all came down to Dance Corps and Dance Troupe. 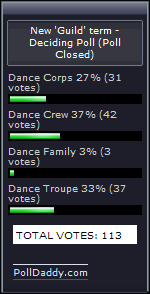 In the final deciding poll, we added Dance Family and the suggested Dance Crew. Gathering 37% or 42 votes out of 113, the new official term is Dance Crew! Thank you to all who participated, from now on all guilds will be called "Dance Crew"!! Trivia: Dance Crew and Dance Troupe exchanged top positions four times (with Dance Corps getting the top position once) but in the end, Dance Crew was chosen by the Community.